It's official. 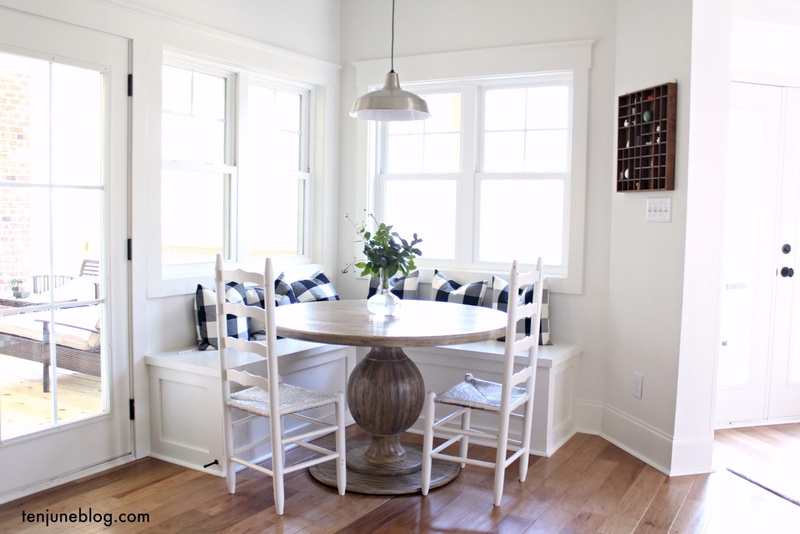 You've officially taken a seat on the DIY crazy train. We thought you were nearing the edge when you decided to make your own jewelry out of hardware or when you decided to DIY David's anniversary gift. And you do like to put a coat of paint on everything in your house, from hallway mirrors to shelves. So maybe it shouldn't have surprised us. 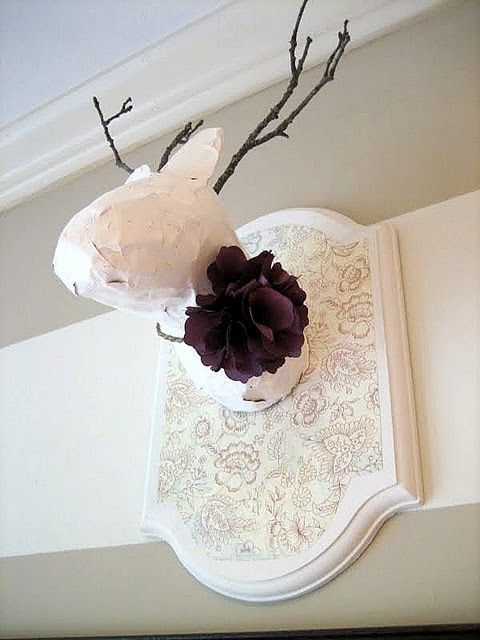 But did you seriously make a deer head out of paper mache? Fo real? I did. 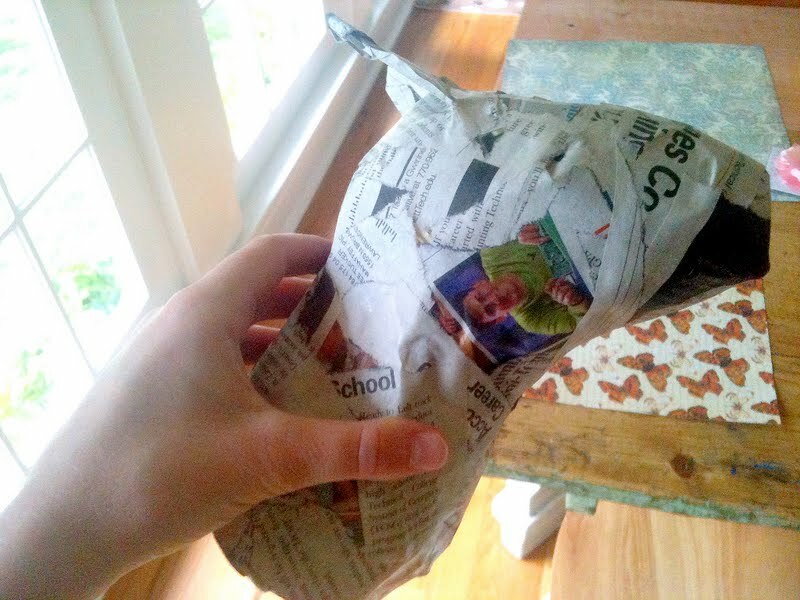 David has now threatened to take away my glue gun, but I actually made a paper mache deer head. And I love it. It all started when my sister-in-law, Kelly, sent me this article. She pointed out the adorable paper mached ketchup bottle vase (you know, like a normal person). I, on the other hand, couldn't get over the deer head. It got me thinking, so I started to do a little research on Pinterest. 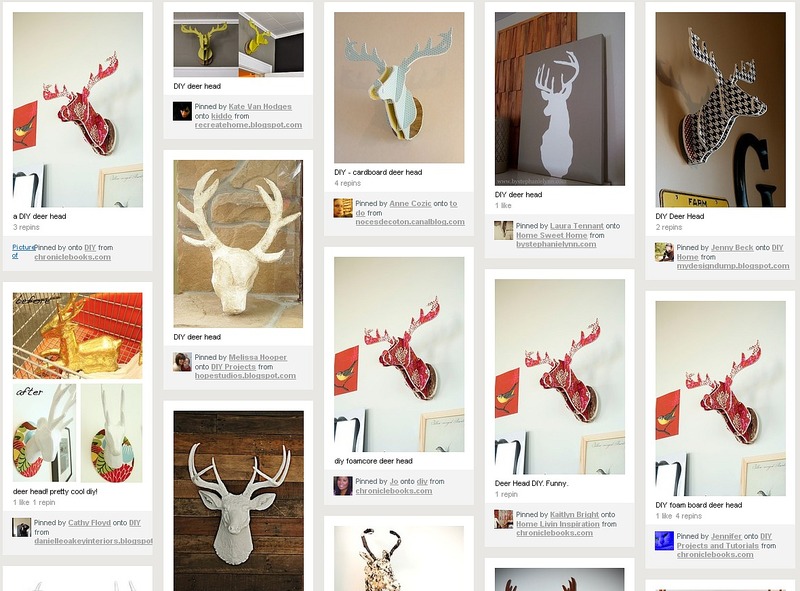 After perusing "DIY deer heads" on Pinterest, I came up with so many inspiring options. I found lots of spray painted and paper versions, but I decided to go with making a paper mache creation. And in honor of the Pinterest Challenge with Sherry, Katie, Lana and Emily, I thought I'd share my DIY version of the deer head. My sister says it looks kind of like a pitbull. David threw out that it resembled an ardvark. As for me? I'm in love. And it found a perfect spot on my office gallery wall. 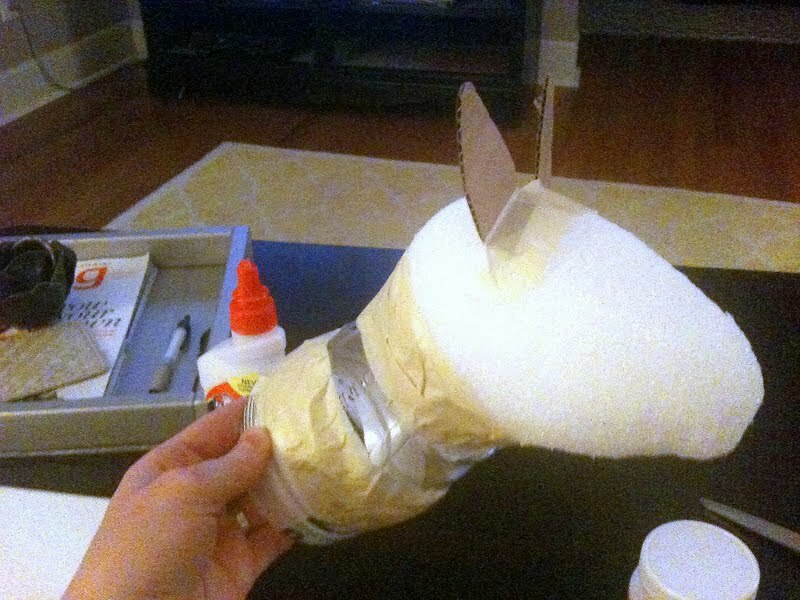 Just like the BHG article says, I made a little deer-like contraption out of a water bottle, masking tape and a foam egg. Ain't she pretty? Then you go old school on your creation and slap some newspaper + Elmers glue + water on it. Cover her in craft paint, jab in some sticks for antlers, hot glue to the plaque and... voila! Paper mache deer head. I still can't believe I made a paper mache deer head. Great! Now my brother hates me! It turned out great...but, can you make me the vase now?!?! This is too cute for words!! I love it!! And she looks perfect on your office gallery wall!! I think Darcey is a cute name for her ;) Darcey Deer! Awww I love it! He's a cute little guy...love where he's living in your office. omg i LOVE this. you have DIYed the classiest, most shabby chic deer on the planet. only you! can you make us a rock-n-roll deer? Name the deer Sheila! I don't know why (and that's my boyfriend's mother's name), but I think that's what she looks like. That's an adorable dear with that flower! Cute idea! I think you should name it Glenn. You crack me up. What a fun project! hahaha that's hilarious! It's so ugly its cute :) That would never fly in my family full of 'true' deer hunters! ok you are seriously the cutest thing ever :) LOVE your office, too! He's so cute! Love the little flower around his neck! I'm scared. I went to Michael's for the first time yesterday (one just opened right by me). Am I goin gto start making DIY antlers too?? I love it! It's so cute. And sounds pretty simple, too. i think you shoud name it david. and then maybe david will like it or you can tell him you will paper mace and mount his head right next to david deer. hats off you to for creating an animal out of paper mache...and here i thought i was crafty when i cut off bears fur and made my own little pet in england..can you rub that deer on your face too when you get lonely? Rhenda was convieced by Rhonda and Glenda. She morphed out of their empty uteruses as a ball of light and then was formed in the heavens and dropped down on your wall to be admired by all. Too cute! I have to suffer through real deer heads and antlers in one given room ! I like the name Daphney! Wow, I just love it. Gosh, I heart this blog. Best of the wall ideas ever! She definitely needs a name! Hmmm.......let me think for awhile :) She's perfect in your office! Doris the Deer. What a great addition to your office. I just posted that my office is officially done... now I'm wondering if I too need a paper mached deer head.. It looks great! My mama would LOVE something like that! HAHAHA. Oh my. I haven't caught on to the deer or antlers thing yet (but I'm sure it will come), but I do have to say this is pretty darn cute. You crack me up!! I love it! It's amazing, and adds character! PS, how do you make that calendar organizer right below the deer head? I'm obsessed with being organized and planning! I think it's absolutely fabulous!!! I like it almost as much as I like the long horn skull I inherited when I married my husband. Seriously, he thought it would be the first to go, but that thing is one of the only things that didn't go! And it's far better than the real deer mount my husband's roommate had above their fireplace when I first met him. They were polar opposites...husband and the roommate that is. This is beyond rad! I've become inexplicably obsessed with these heads but they were way out of my budget and I couldn't figure out how to do a diy and so was so psyched to see it on the pinterest challenge.. I'm so excited to build my own pit-ard-deer! Thanks for the inspiration! I made a deer of my own... and copied your stripes! love following you!